The 2012 London Olympics have now finished, and as a UK company we were pleased to see the games were such a success, and of course that team GB did so spectacularly well! We’re looking forward now to the Paralympics in a couple of weeks, and once the dust has settled there we’ll be shipping a new point release of XLCubed in September. We’ll keep most of the changes under wraps for now, but one item which we are introducing is treemaps. 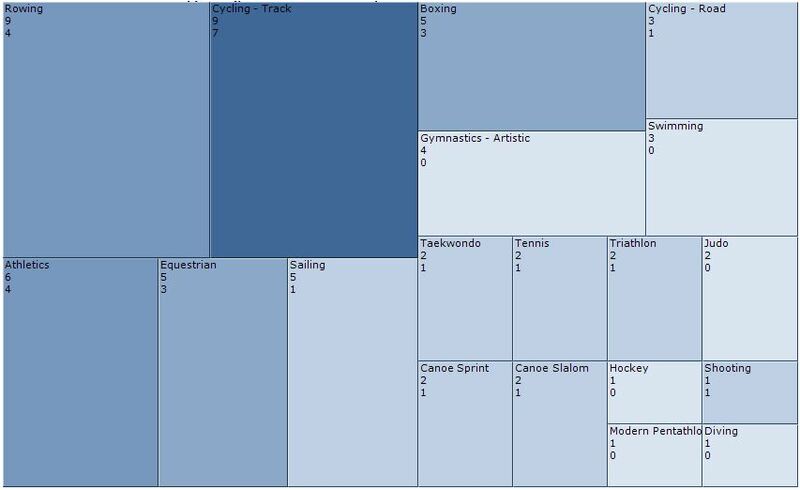 The Olympic medal table gives us a nice opportunity to better understand the medal breakdown through the new chart type. 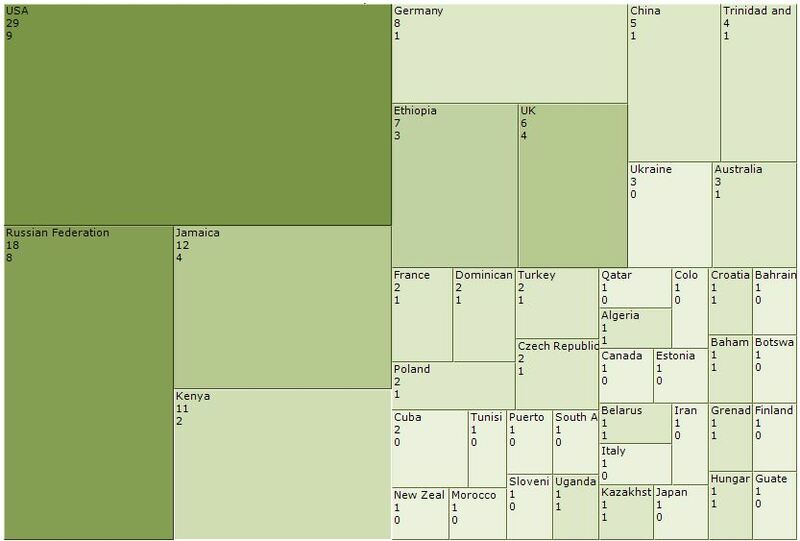 In XLCubed, treemaps can be produced directly from a cube or from a table held in Excel, as is the case here. 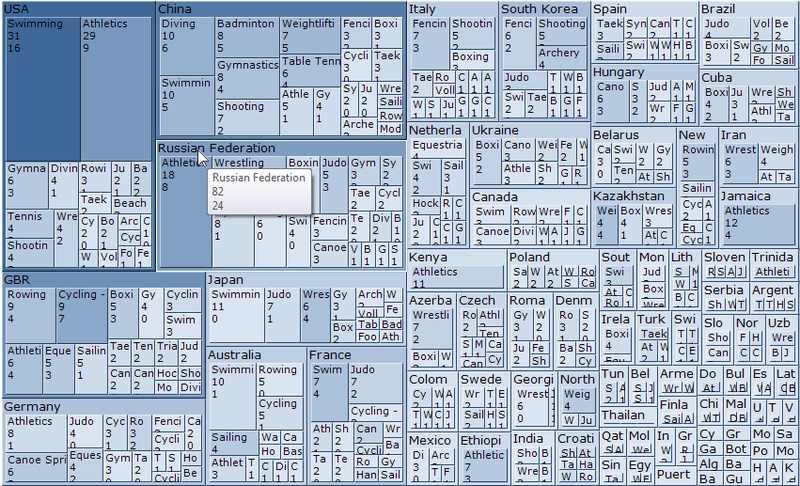 The first example below shows the medals split by country and sport. The size of the rectangle depicts the total number of medals, and the colour shows the number of gold medals, the darker the colour the more gold. The numeric values list the total number of medals, then the number of golds. We can see the USA at the top, and that over half their medals came from swimming and athletics, with a bigger percentage of golds in the pool. Any of the countries can be drilled into for a large view on their medal breakdown, not that we’re partisan of course… , but the view below is for Great Britain (GBR) where the particularly good showing by the cycling team stands out. 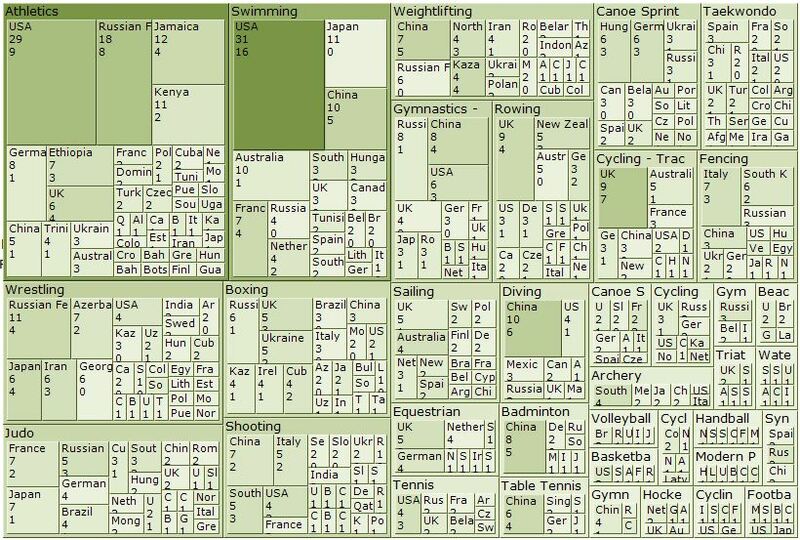 Taking a look at the same data split first by sport and then country, it’s easy to see the countries dominating the medals in each sport, and to delve into more detail by sport where required. Drilling into Athletics we can see that USA won most medals, and also most gold. Great Britain had just the 6 medals, but 4 were gold and hence the darker colour on their tile. We’ll be making an interactive version of this available over the next few days.